Excel software is covered in-depth in this deluxe edition. 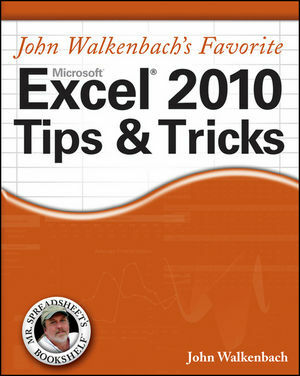 Favorite Excel 2010 Tips & Tricks by John Walkenbach presents techniques, tips and tricks for using Excel efficiently. The aspects addressed include function arguments, impossible charts, pivot tables, and more. Readers can learn about specific tasks, such as copying print settings across sheets and using automatic toolbars. The topics help anyone who wants to utilize Excel's features more fully. John Walkenbach is arguably the foremost authority on Excel, has written 50+ books, including the bestselling Excel Bible, Excel Formulas, and Excel Power Programming with VBA, as well as more than 300 articles for publications such as PC World, InfoWorld, and Windows. He created the award-winning Power Utility Pak and provides Excel information and insight at www.spreadsheetpage.com.